Before beginning to use Fusion Tables, if you don't have one already you'll need to create an account with Google. Short faq-like help pages and a few tutorials on doing things using Fusion Tables. 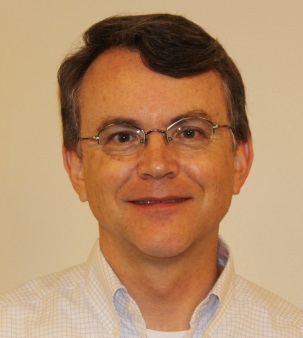 Announcement of introduction of Fusion Tables by Google on their Research Blog (June 2009). Fusion Tables API. Also see link to Reference Guide. Discussions by programmers interested in integrating Fusion Tables into other applications. Fusion Tables is a cloud-based web service provided by Google intended for managing, visualizing, and sharing tabular data such as might be used in database programs, parallel to what Google Drive (Google Docs) does for textual information and simple spreadsheet data. Google will store for you on the web up to 100 MB of data per dataset, and 250 MB per user. There are a number of options for visualizing data using graphs, charts, and maps. There is a strong focus on being able to merge data from different sources. Perkins Data/GIS users may see this as an alternative to the Merge command in Stata, the Join technique in ArcGIS, or the Join statement of SQL. There is also a strong focus on collaboration, as with Google Drive. Your data can be shared or commented upon if you choose, and can be exported in comma-separated-value (CSV) format. NOTE: For the time being, this guide refers to the Fusion Tables "Classic Look." In a table, choose Help...Back to Classic Look. When using the Classic Look, a link in top right will allow you to "Switch to New Look." Connect the Fusion Tables application to your Google Drive for quick and easy access. To connect the Fusion Tables app, click the red Create button at the top left of the webpage. Next, click "Connect More Apps." 3. Search "Fusion Tables" in the search box. 4. Click the blue Connect button. 5. Click OK and you're done! 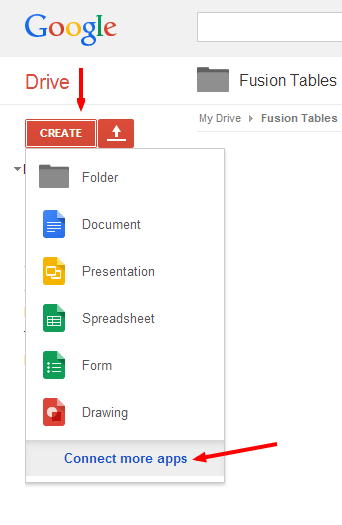 Fusion Tables app is now connected to your Google Drive. Next, Learn how to upload data.